Brick-and-mortar bookstores are facing hard times as Amazon and other online retailers offer convenience and lower prices. Nevertheless, many real bookstores are making serious efforts to win customers’ hearts and make their life and work more fulfilling by offering good book selections and well-devised displays in addition to sincere assistance from store clerks. Foreign book departments in Japan are no exception. 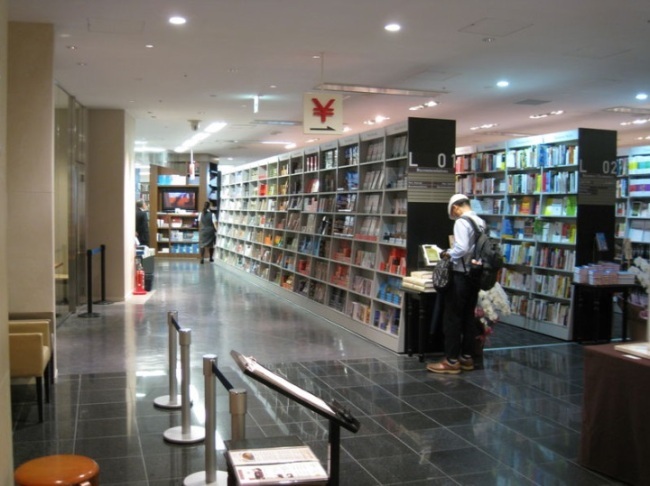 On Sept. 1, Maruzen Bookstores Co. expanded the area of the foreign book department at its Marunouchi Main Store by about 40 percent. The expansion has increased the number of books on display at the department from 90,000 to 120,000, mostly in English. The expanded area used to be occupied by a shop dealing in music CDs and DVDs. After the expansion, the department now carries more specialized books, such as on economy, finance, business administration and science, mainly for businesspeople and academics, according to Daiki Hakoyama, who is in charge of the department. “We’ve doubled the number of business books and tripled economics books, for example,” Hakoyama said. The Marunouchi store is housed in the OaZO business and shopping complex building just across the street from Tokyo Station’s Marunouchi North exit. “Our store is also close to the Otemachi district, which is home to the headquarters of many banks. So, we expect our new selections will attract people there,” Hakoyama said. Near the escalator area, long rows of bookshelves are separated by spacious aisles. The first row, “Recommendations,” features best-selling current fiction together with earlier works by the same authors, including Jeffrey Archer, Lee Child and Tom Clancy. The layout enables customers to see currently popular books at a glance. The second to sixth rows are filled with books on economy, finance and business administration, clearly indicating that the department has been drastically changed, with greater emphasis on these fields. On the fiction bookshelves, two English versions of Haruki Murakami’s “Colorless Tsukuru Tazaki and His Years of Pilgrimage” are on display side by side. The English translation was released on Aug. 12, and shot to No. 1 on The New York Times’ best seller list. It is said that people are losing interest in reading books. “These days, students buy fewer books. It’s partly because universities have their students use e-textbooks. It’s a problem for us,” Hakoyama said. Meanwhile, the number of foreign residents and tourists is increasing in Japan these days. The trend is expected to accelerate as Tokyo is set to host the 2020 Olympic Games. To live in the global environment, good English books for work, fun or improving English proficiency are required more than ever, Hakoyama said. Books Kinokuniya’s Shinjuku-Minami store near Shinjuku Station puts more emphasis on fun elements and attracting foreign customers at its foreign book department, which is also one of the largest in Japan. The department doubled its area on May 29 and now carries about 120,000 books with more fiction, books for children and overseas magazines than before. About 85 percent of the books are in English, while the remaining 15 percent are in other languages, such as French, German, Italian and Spanish. Due to the selection, the department attracts as many foreign customers as Japanese customers, while the ratio was 40-to-60 in the past. The department has benefited from the popularity of two recent films. The book “When Marnie Was There” has been selling well in relation to Studio Ghibli’s anime film adaptation released in July. Also, due to the immense popularity of the Disney animated film “Frozen,” released in March in Japan, related books are also selling well, according to Mona Sumi, who is in charge of foreign books at Kinokuniya Co.